Warm milk( tepid not too hot or too cold) add sugar mix well until sugar is dissolved combine this to the yeast. Cover leave aside for 5mins to 7 mins until it froth (make sure the milk is tepid means not boiling hot or cold) and look at the yeast sell by date also. In a large bowl sift flour, nutmeg, add butter to form fine crumbs, add egg then milk & yeast mixture. Give it a good mix and knead in electric mixer for 7 minutes or by hand for 15 minutes. Cover and leave aside for 1 hour in a warm place. Punch dough dust board knead for 5 minutes and roll long place on baking tray. Cover and let sit for 30 minutes. Once doubled in size cut the center of the dough 1/4 way down. Heat oil and fry drop 3 at a time turning often, 3 to 4 minutes on medium flame once it turns light brown. 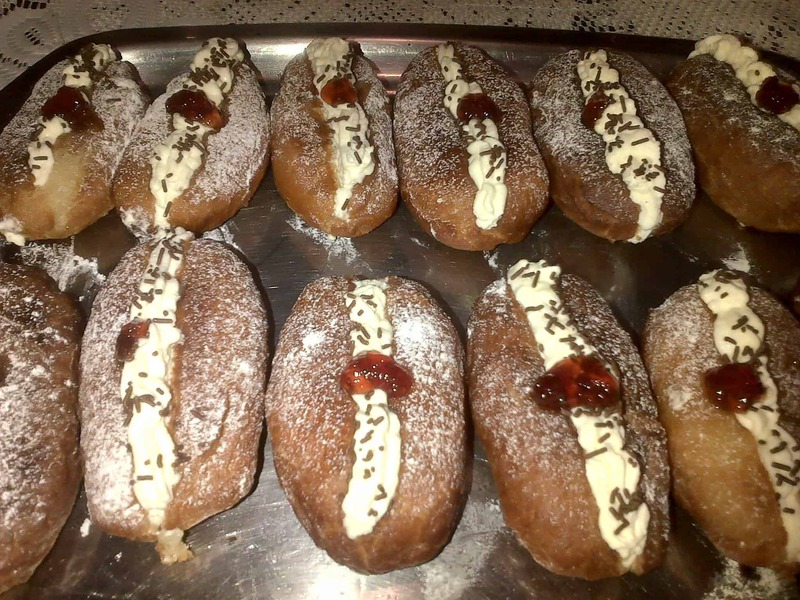 Remove from heat and dip into sugar syrup (this keeps the donut slightly crisp outside and soft inside) let it cool and pipe buttercream icing sprinkle with chocolate and melted jam optional. This yields 10 to 12 donuts depending on the size you require.